A10 is a coloured version of the "Windsor" pattern in the Airlie shape. A12 is a cream soup and stand in the Chelsea Shape. The A12 variant plate includes an Ellis centre. Sometimes the addition of a centre decoration merits a revised pattern number, but not apparently in this case. A18 - Tavistock shape with ivory ground all over, wild roses to rim and centre. A21 - As A18 but with ivory ground to outer rim, inner green band to shoulder, wild roses to rim and centre. A41 - Listed as being in the Portman shape this example appears to be in the plain shape. 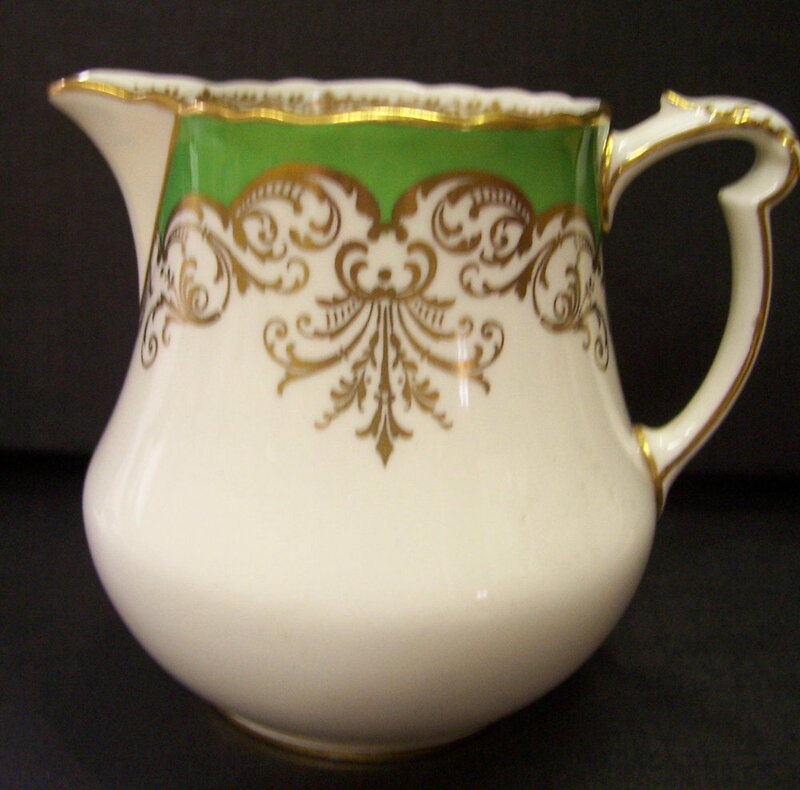 Green ground to rim with ivory ground to below the shoulder both overprinted with patterns in gold. Ellis centre. A54 is a variation of the Melton "Barbed Wire" pattern. Here it is shown in the Square Chelsea shape. A56 is a gadroon version of Posie and is ungilt. A58 appears in the Square Chelsea shape apart from the green version which is in the Ely Shape in this example. The red version is marked "Hardy Bros. Australia". A67 in the Edinburgh Shape. A harlequin presentation set of six with silver spoons. These are also found with King Street factory marks and were perhaps originally a King Street product which was subsequently manufactured at Osmaston Road after the takeover. A67 - Less commonly found silver gilt version, here with a celadon ground. Also shown a silver gilt tea set, in the Ferrers shape, in the same pattern. A67 - Less commonly found silver gilt version, here with a celadon ground. A70 is a bread and butter plate in the Square Chelsea shape. It is silver gilt. A72 Blue Aves is shown here in the Square Chelsea, Queen Ann and Surrey shapes. This pattern was re-issued as A1309. A73 Olde Avesbury here shown in the Square Chelsea, Elgin and Surrey shapes. The popularity of this pattern is demonstrated by the fact that it forms part of the Company's current production. A74 is another Bread and butter plate in the Square Chelsea shape. This pattern appears to have been discontinued at an early stage and the number re-allocated to the Red Aves pattern. The Red Aves cup and saucer is in the Chelsea shape. Aves was also produced at this time in green, brown and pink versions. Uncommon "Point of Sale" side plate with date cipher for 1961. A78 is a tea cup and saucer in the Dover shape. A84 is in the Square Chelsea shape. A84 is a red version side plate. A85 is a coffee pot in the same pattern with a cobalt ground. A96 is a tea cup and saucer in the Chelsea shape. A99 is in the Dover shape. In the pattern book A100 is listed in the Ferrers shape but here it is in the Square Chelsea shape. 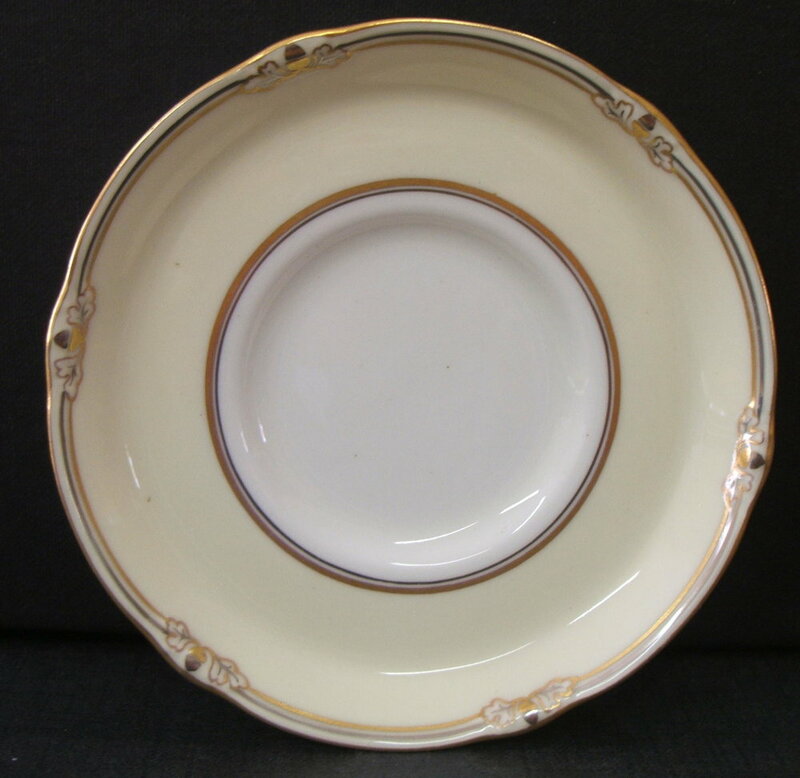 A106 is a saucer in the Tavistock and Talbot shape and has platinum and gold gilt acorns. Ivory ground. Patterns A108 & A109 are both in the Gadroon shape. A108 has green and silver tracing, with green and gold in the case of A109. A110 is found on the smaller trays (Sweets 1800-1803) and also on a cigarette box 1920 shape. 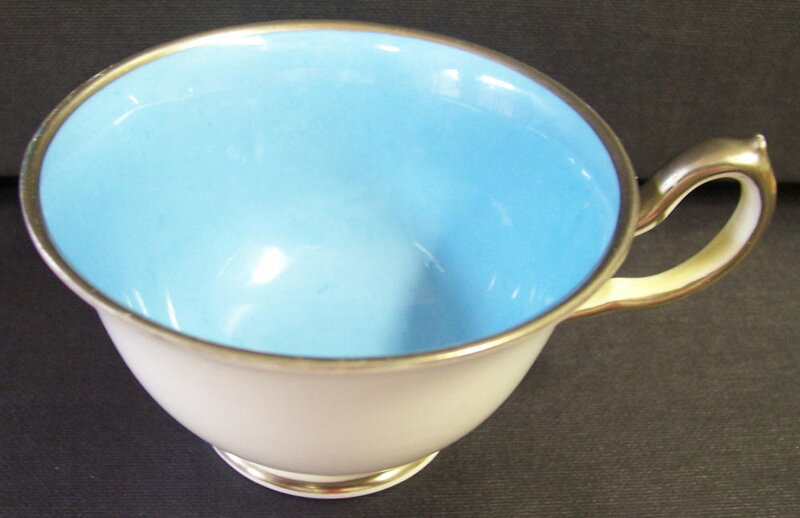 A128 is a coffee cup and saucer in the Silver shape. A130 - Scenes of High Tor Matlock and Chatsworth House by "Dean" in the Talbot shape. 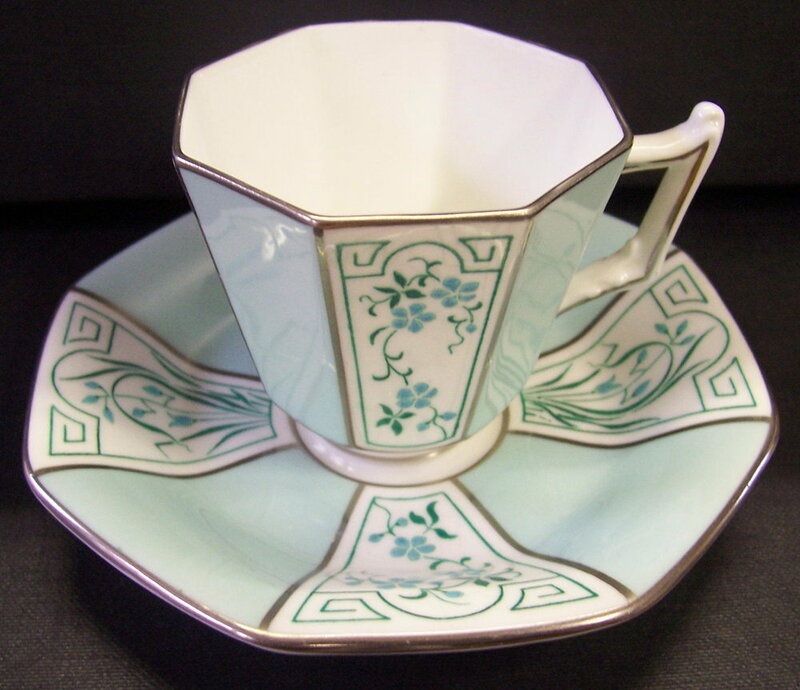 A144 is a Chelsea shape coffee service (sugar missing) with celadon ground and green enamel edging. A146. Part tea set in the Marlow shape with burnished silver edge and swirl. A163 is described in the pattern book as being coloured by Gresley and in the Marlow shape. The saucer shown above in the square Chelsea shape is unsigned. A172 - Elgin shape teacup. The pattern is characterised by coloured grounds inside the cup. A173 comprise seascapes in the Silver shape by Dean with Montreal Green and Ivory grounds. It is not uncommon to find that Patterns A173 and A235 are mismarked - the shapes being confused. It is understandable, especially where the gilders and enamellers were paid on a piecework basis. A173 Celadon version. A189 is a bread and butter plate in the Plain shape. Ivory ground. A192- Square Chelsea shape. A version of pattern A84 and A85 but in Antwerp blue. The green version of A197 is in the Ferrers shape, the cobalt version (tea cup and saucer) is in the Ely shape. A197 - a maroon version in the Chelsea Shape. A200 is here shown in the pink and celadon ground all over versions. The jug is the tea cream size. Chelsea shape. A204 - Dinner plate in the plain shape with ivory ground all over and central vase motif. Printed in sap green with laurel leaves coloured in Emery’s yellow green. Gold edge. Marked Plummer Ltd. New York. Pattern A193 (Not shown) is this pattern with an ivory band. A390 (Not shown) is the same as A204 but with a plain centre. A219. A part coffee service in the Ferrers shape. A220 is in the rare Octagon shape and is silver gilt. All the Ingleby pieces here are in the Surrey shape. Ingleby was also produced in the Ely shape. 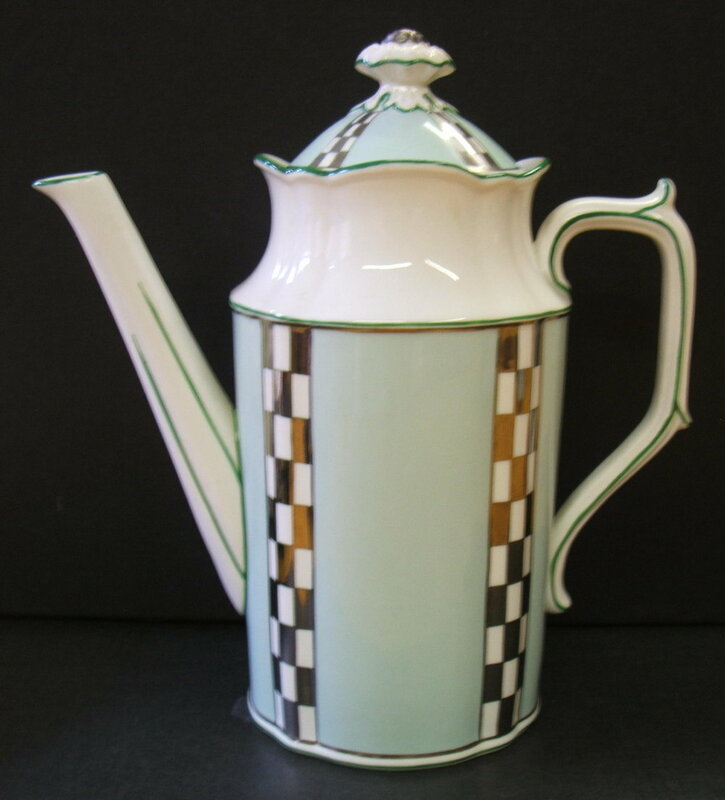 A224 - A coffee pot in the rare Octagon shape - Shape number 1915. A227 is a plate in the Ely shape with a Montreal green ground to the outer rim. A228 is the pattern number for posie in its basic form. A suitably inscribed posie christening mug, painted and signed by Mosley was presented to Princess Elizabeth at the time of her factory visit to mark the occasion of the birth of Prince Charles in November of the previous year. The first piece produced was considered too large, and a smaller version was actually presented. The original was retained in the family and eventually sold by public auction. If you know of its present whereabouts do let me know. It is perhaps surprising that the opportunity was not taken to produce replicas for sale to the general public. A230. Coffee cup and saucer in the Chelsea shape. The plate which follows is believed to be in the plain shape and is a version with a maroon band. A235 is in the Brighton shape with a Dean centre. This image of A240 shows a miniature tea caddy. Patterns A241-A248 have two different colour border patterns, two different motifs and were produced with or without centre patterns. All are in the Ferrers shape. The plain centre versions (see A245 and A247 below) appear less often and were presumably less popular. A centre decoration does make a plate more versatile as it can also be hung on the wall as an ornament.